If you met David Chai along the road, you would never suspect what he does. David is a pastor. He is not your ordinary pastor through; he has his own farm that he operates. He works hard and his calloused hands and soiled clothes prove it. I know what you are thinking. . . this is Cambodia, that is pretty common. Yes and no. 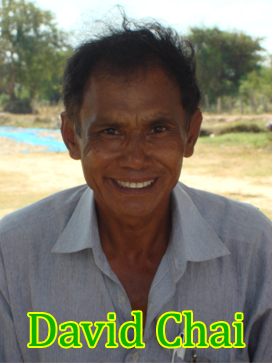 David is from Cambodia, but he lived more than 30 years in the United States and is an American citizen. So, an American, living, pastoring and farming in Cambodia, by choice is not common at all. David has a 31 hectare farm (more than 70 acres). He raises cows, grows some rice, raises massive hogs and has hundreds of ducks and chickens. He also runs and operates his own rice mill and buys other farmers rice to mill it. David supports a few orphans and gives young people jobs so they can learn to work and one day run their own farms too. This is how he supports himself, his family, his friends and his ministry. David survived the Khmer Rouge back in the late 70’s. It is an amazing story of God’s preservation. David was a Buddhist, just like most Cambodians, and when the Khmer Rouge came to power they killed anyone who was of no value to them. Especially toward the end of the Khmer Rouge reign they just started executing people. One day, two Khmer Rouge soldiers took David to be killed along with a large group of people. The soldiers made the people dig a hole and then when the temperature got very hot, they rested in the shade. While they rested, a group of monkeys came out of the jungle. The Khmer Rouge started shooting them out of the trees. They killed 8 monkeys. They proceeded to untie the individuals and kill them with a blow to the head. Their bodies collapsed one by one into the open pit. The last one to be killed was David, still tied to a tree. His death was certain. Then the soldiers looked at their monkeys. They talked to each other and then went to untie David. They said to him, “you carry our monkeys, there are too many for us to carry.” David was numb with shock. The soldiers were going to let him live, so he could carry their monkeys back to the village. Though he was not a Christian at the time, he knows that God preserved him for a purpose. After the Khmer Rouge were invaded by the Vietnamese David and a group of 15 other young people decided to escape to Thailand. Only 7 survived the journey through the jungle. The whole jungle was mined and booby-trapped. David, when walking, even stepped on hidden bamboo spikes which pierced both his feet. He still has the scars on his feet to this day. Somehow, by the grace and mercy of God, he survived and made it to Thailand. After many years there he was sponsored to go live in America by a Mennonite pastor named Darrell Caldwell, who later came as a missionary to Cambodia as well. For thirty years David worked hard and eventually sponsored his entire family to come to America. In California he worked on many farms and learned how to efficiently grow crops and market them. Two years ago David moved back to Cambodia after more than thirty years in America. He wants to help his country. He bought a bunch of land to make his farm. He built all the buildings and started working hard; just like he has always done. Even though he has severe asthma, he runs the farm and keeps in inhaler with him at all times. Within two years he had a model farm for the community. People started bringing orphans for him to care for, and since he knew what it was like to live like an orphan, he just worked harder to support them and care for them. Then he had an idea. He wanted to go find the place where his life was saved; where he was tied to a tree in preparation to be executed. So he went. It was a long drive on his old motorcycle and it broke down, but he just kept going. Once he got there. He found the spot. He met the local villagers and he told them his story. It is likely that some of those he was talking too were actually Khmer Rouge soldiers. Then he proceeded to tell them about Jesus. After spending a few days with them, a group of about 20 people had become Christians. David promised them he would return once a month to disciple them in their new church and he has done so. David is a guy who has every excuse in the world to just take it easy. Few of us have had the difficulties in life that David has. Few of us can barely imagine how hard life has been for David. Yet David knows who he is in Christ and he is grateful for the life that Jesus has given him. He devotes all of his effort and work for the purposes of the Kingdom of God. In only 6 months he has already started 3 new churches and that is his part-time job! His full time job is running a 70 acre farm, a rice mill, raising dozens of cows, feeding gigantic hogs and finding markets for all he produces. David is an excellent example for all of us.